What are the most popular online bachelor's degrees offered in Florida? Florida has supported distance and online learning programs for decades. In 1996, the state launched the Florida Community College Distance Learning Consortium, a network of public and private colleges that work to create and develop statewide online learning initiatives. Next came the Florida Virtual Campus in 1999, which provides online educational resources and support to high school and college students. These resources include access to digital journal and library databases, online courses, and virtual student services. Together, these initiatives make Florida one of the best states for online learners. Between 2006 and 2011, enrollment in postsecondary online courses increased by 128.8%, and today there are well over 150 online colleges, degree programs, and learning initiatives throughout the state. Online colleges in Florida have provided a venue for frugal students to obtain degrees and certificates without incurring significant debt. Like most states, tuition rates in Florida have spiked in recent years alongside major cutbacks in state funding and appropriations. However, grants account for nearly 12% of the state's total financial support for higher education, a significant allocation that helps individual students save on tuition and related expenses. Additionally, the rise of online programs has encouraged many students to study in a distance program, where costs are generally lower. For over 160 years, UF has provided higher education to the people of Florida and beyond. The school’s online sector, UF Online, offers a wide variety of degree and certificate programs, including 19 bachelor's degree options for students who require more flexibility in their schedules. Among these options are the BA in geology, the BS in sport management, and the BS in telecommunication media & society. UF Online also offers bachelor completion programs that lead to bachelor’s degrees in communication sciences & disorders, digital arts & sciences, fire & emergency services, and microbiology & cell science. Distance learners can earn certificates in specialized subjects and enroll in non-degree and non-credit courses from the comfort of their home, as well. UF Online provide its students with the same library and resource privileges as on-campus students, and offers complete support in all areas, including technical, admission, financial, and career support. Surrounded by 800 acres of woodland, UCF’s main campus in east Orlando is one of 12 regional campuses and locations spread out to best serve the community in Central Florida. In addition to its physical campuses, it’s also one of the best online colleges in Florida, offering courses online for the past 20 years. Today, UCF Online provides more than 20 online bachelor's degrees in areas such as the sciences, arts and humanities, and health and public affairs. Online students have complete access to UCF's entire library, as well as the Writing Center, Career Services, and all on-campus athletics events. To ensure its online students are supported fully, UCF Online pairs each student with a Student Success Coach, a school representative who takes on the responsibility of aiding and guiding online students throughout their experience, answering questions, sending reminders, and helping students navigate their way through their degree or individual courses. When it was founded in 1965, FIU became the first public research university in Miami. Today, with more than 54,000 students, FIU is among the 10 largest universities in the U.S. and remains the only public research university in Miami. With over 27 fully online programs, including 20 bachelor's degrees, FIU online has something for everyone. In fact, almost half of all FIU students take online classes in some fashion during the school year. Some unique programs on offer include the BS in recreation and sports management, a BA in communication arts, and the FIBA anti-money laundering certification. The school also offers a selection of Massive Open Online Courses (MOOCs). These courses are free, open to anyone with Internet access, and offer an introduction to online learning through the school. FIU offers 24/7 technical support, success coaches, and access to every resource students have on campus. The fourth-largest public college in Florida, USF maintains a selection of focused online programs. The Tampa-based school offers seven online undergraduate degree completion programs in fields such as criminology, applied sciences, information technology, and nursing. Applicants must be transfer students who have completed an associate degree or the equivalent number of credits. USF students complete upper-division coursework online and asynchronously. The online degree completion programs include no campus visits, but some programs include practicum, clinical, or internship experiences. As a member of the State University System of Florida, USF offers discounted tuition rates for Florida residents. USF is one of the most affordable online colleges in Florida; 60% of full-time undergraduate students receive financial aid. 5 Florida State University Tallahassee, FL Cost: $$$$$ Graduation Rate: 80% online undergraduate programs in fields such as applied science, computer science, criminology, and social sciences. FSU's online programs include no in-person requirements. Delivery methods vary by program; online courses utilize asynchronous, synchronous, and blended learning models. Applicants to FSU’s online programs must have an associate degree or about 60 previous college credits. Applicants must submit previous college transcripts and SAT or ACT scores. New students can enroll in the spring, summer, or fall. Like many online schools in Florida, FSU offers discounted tuition rates for state residents. However, certain programs offer a discounted market rate for non-residents, which FSU calculates using the average cost of similar programs. Home to around 13,000 students, UWF has physical locations all throughout Northwest Florida, including the main campus, which is situated in Pensacola. With some of its core values being inclusiveness, quality, relevance, and innovation, UWF is one of the best online colleges in Florida, offering more than 500 online course sections each semester, and seven fully online undergraduate degrees that provide all the upper division coursework necessary to graduate. Online bachelor’s programs include a BS in engineering technology, a BA in exceptional student education, and a BA in maritime studies, among others. All the lower division coursework in these programs is available at UWF or through its partner institutions. Approximately 30% of UWF's student body study completely online. For this reason, the school provides its students with substantial technical support and online resources, ensuring that online students are supported every bit as much as the students are on campus. Since 1943, BCF has been providing a private program of education and training for Christian leaders in Florida and the surrounding area, presenting its teachings within the framework of a Christian worldview. With its home campus in Graceville, Florida and three additional distance sites in Orlando, Northeast Florida, and Panama City, BCF has made its mark on the state of Florida and its inhabitants. BCF offers a wealth of fully online programs, including 18 bachelor's programs in Christian studies, music, missions with a concentration in aviation, and more. Every student at BCF is also required to take foundational curriculum, which includes a combination of general education coursework (33 hours) and biblical and theological courses (18 hours). Distance students at BCF have complete access to the school's online library resources and support services, and typically asynchronous online courses can be completed from any approved location and during the time of the week that works best for the individual student. Located north of West Palm Beach, Florida, HSBC is a small, private college affiliated with the conservative holiness movement. The college enrolls about 200 students and offers five associate degrees and five bachelor’s degrees online. Hobe is one of the best online schools in Florida for students seeking a biblical education, as the college offers programs in ministerial studies and the Bible. Applicants must hold a high school diploma or GED and must demonstrate commitment to the school’s doctrine. HSBC accepts transfer credits earned with a grade of C or better, and students must earn at least 30 credits on campus. All online students pay the same tuition rate, regardless of residency. St. Petersburg College features brick-and-mortar campuses all across the state and more than 100 degree and certificate industry-based programs, but it is also the largest and one of the best online colleges in Florida. With over 20,000 online students, 650 online courses and over 40 fully online programs, SPC's online campus utilizes the best in eLearning technology, online resources, and educational software. The school offers 12 online bachelor’s programs, including degrees in dental hygiene, sustainability management, interdisciplinary studies, and more. Like most online courses, SPC's online programs provide increased scheduling flexibility, but they also provide a one-on-one instruction not available from traditional classes. The eLearning at SPC also has a virtual classroom that allows for a hands-on approach to online instruction and a structured interaction between student and instructor. This means that online courses at SPC are much more similar to on-campus courses than in most online colleges, something that many students look for when considering online programs. Based in Tampa, Everest University became a nonprofit school in 2015. The university offers online degrees in accounting, law, business, and computer information science. Students in the flexible online programs complete coursework asynchronously. Everest’s online programs include no on-campus requirements and follow a cohort model; online students progress through coursework with a small group of peers. As of March 2018, Everest is not accepting new online students. However, information about the school's online programs is available, and Everest may begin enrolling students in the future. Everest charges a per-quarter tuition rate, and all online students pay the same rate regardless of residency. Unlike other online colleges in Florida, Everest currently lacks regional accreditation, although it was accredited by the since-derecognized Accrediting Council for Independent College and Schools. For many years now, NSU has been nationally recognized for its innovative distance education programs. Since its start, one of NSU's institutional missions has been to provide students with the most convenient methods of study, leading to the establishment of one of the leading online colleges in Florida. The school offers online bachelor's degrees in business management, health science, psychology, and nursing. Online students join and interact within real-time electronic classrooms, and NSU has built a substantial eLibrary and online database that gives students access to everything their studies will require. While many of NSU's online students live and study far from Florida, they still have access to more than 400 undergraduate and graduate student organizations run by the university's students, faculty and alumni. For those students who are in the Florida area, NSU also has the added benefit of hosting the Miami Dolphins training facilities. This partnership grants NSU students access to seasons tickets for the NFL teams' home games as well. Providing adult learners with a career-focused education, Keiser University-Fort Lauderdale has been serving the Florida area residents for the past 40 years. The school has grown to become one of the top Florida online colleges, with 16 bachelor degrees available online. Notable programs include the BS in imaging sciences, the BS in cyber forensics/information security, and the BA in homeland security. Keiser University's online courses and degree programs allow students the opportunity to study and work at the same time. The school's mandatory scheduling of one class at a time allows students to dedicate their entire focus into one area for four weeks and then move on. The institution also provides small class sizes and flexible scheduling that allows students to choose between on-campus courses, online courses, or a combination of the two. Both on-campus and online students have access to hands-on instruction, which gives students a practical education that they can draw from after graduation. Additionally, all students are encouraged to take advantage of the online career center as well as the student organizations that are available to them. Founded in 1935 as the Alabama Shield of Faith Institute, Southeastern has seen significant changes in its history, including locations, but its Christ-centered student-focused approach to education has stayed the same. The institution that started in New Brockton, Alabama has since moved to its current location in Lakeland, Florida, but a Southeastern University education is available to students from all over. As one of the top Florida online colleges, Southeastern delivers an unmatched experience to students looking for online degree programs in fields such as business, behavioral and social sciences, ministry, and more. From enrollment through to graduation, online students at Southeastern have help every step of the way. The Center for Student Success offers students a range of assistance, including tech support, tutoring services, and even counseling. The online portal provides students with access to Southeastern University's entire digital library database from anywhere that has an Internet connection. In 1998, FGCU held its first ever commencement ceremony in Southwest Florida with 81 graduates. Now, less than 20 years later, more than 23,000 FGCU graduates have received at least one degree from the institution. In that time, FGCU has grown into a state university that offers 79 degree programs to close to 15,000 students annually. During its second semester as a university, FGCU began the process to adopt distance learning as one of its primary delivery methods, granting program access to students across the country and the world. Fast forward to today and FGCU is one of the best online colleges in Florida, offering both graduate and undergraduate courses to students whose lifestyle, location, and/or schedule restricts them from in-person studies. At FGCU, it's not only the students who have access to a wealth of technical support and resources but the instructors as well. Since the school is committed to delivering the best online courses in the country, it ensures that its faculty have everything they could need at their fingertips, from assistance with course design to online training to course material development. Seminole State offers one of the most concentrated set of programs among online colleges in Florida. The college offers three online BS degrees: information systems technology, business and information management with a concentration in supply chain management, and health sciences. Each program comprises asynchronous coursework delivered through the Canvas learning management system. Applicants must have earned an associate degree with a minimum 2.0 GPA. Students can enroll for the spring or summer term. As a state school, Seminole State charges an additional fee to students who are not Florida residents. Seminole State offers a variety of scholarships available to distance learners. SCF operates campuses in the counties of Manatee and Sarasota in southwest Florida. The college offers individual classes and entire programs fully online. Like other online schools in Florida, SCF utilizes a variety of delivery methods, including asynchronous and blended course delivery methods. However, SCF delivers most of its online courses asynchronously through Canvas. Many programs require students to take exams at an SCF campus. Students receive technology support at all hours. Learners have access to advising and counseling center. The college maintains a dedicated, five-person distance learning team to support online students. Florida residents pay a discounted per-credit tuition rate. SCF requires no minimum GPA or standardized test scores. Based in Deerfield Beach, SFBC&TC offers online bachelor’s degrees in religious education, pastoral ministry, Christian counseling, biblical studies, and business management. The school also offers online master’s degrees in biblical studies and divinity. While students can complete 49% of bachelor's degree requirements online, the school’s master’s programs are entirely online and include no on-campus requirements. SFBC&TC delivers online coursework asynchronously. SFBC&TC is one of the most affordable online colleges in Florida. The school awards more than $600,000 in financial aid each year. Online students have access to academic advising, counseling, financial assistance, and personal assistance. All online students pay the same per-credit tuition rate, regardless of residency. The admissions office gives preference to students who submit their applications at least four weeks before courses begin. Far removed from its beginnings more than 50 years ago, Daytona State has grown from a small one-campus college to a technologically advanced multi-campus institution. Today, the college has a total of seven locations throughout the Volusia and Flagler counties in Florida, and offers more than 100 different certificate, associate, and bachelor's degree programs. Online students can pursue a BAS in supervision and management, a BS in engineering technology (with or without a concentration in electrical engineering), or a BS in information technology. With almost 300 online courses to choose from, the school's mission to expand and enhance the technological infrastructure and online environment has been a massive success. As part of its commitment to its online students and faculty, Daytona State offers the same academic support for online students, the same course standards for online classes, and the same level of interaction between online students and faculty as it does with its on-campus programs. A member of the University of South Florida system, USFSP offers three online programs: master’s degrees in business administration, digital journalism and design, and educational leadership. Each program delivers eight-week courses asynchronously. Some programs require on-campus orientations in St. Petersburg; however, none of the programs include on-campus requirements beyond orientation. With several online courses recognized by Quality Matters, a national organization that evaluates online education, USFSP is one of the best online colleges in Florida. USFSP offers discounted tuition rates for in-state students. Applicants to USFSP’s online programs must have at least a 3.0 undergraduate GPA and must submit GRE or GMAT scores. USFSP waives the GPA requirement for master's degree holders. GCSC is located in Panama City and maintains learning centers at Port St. Joe, Southport, and the Tyndall Air Force Base. The school offers a variety of online programs, including associate degree, bachelor’s degree, and certificate programs in fields such as entrepreneurship, organizational management, and nursing. Many of GCSC's programs are available in a fully online, asynchronous format; the college offers other programs in a blended format. GCSC is unique among online schools in Florida for its participation in Florida Shines and the Southern Regional Education Board Electronic Campus, which allows GCSC students to take online courses through other colleges. Online students have access to academic advising from a dedicated eLearning team. Each online program has unique admissions requirements and start dates. Florida residents pay discounted tuition rates. With several locations throughout the Duval County and Nassau County, FSC at Jacksonville offers fully online courses and an online BS degree in business administration. To bolster its reputation as one of the best online colleges in Florida, FSCJ Online provides its students with many of the technological resources required for their studies, such as Microsoft Office and more. For students who don't have access to the Internet, FSCJ grants access to its state-of-the-art computer labs. The school also has degree coaches on hand, ready to help students transfer credits, find financial aid, and enroll in the courses and programs that are best suited for their interests while still satisfying their program requirements. For students in the Jacksonville area, FSCJ provides countless services and facilities for its students, including child care, counseling services and access to fitness centers as well. UNF offers 11 online undergraduate, master’s, and doctoral programs in health sciences, arts and sciences, and education and human services. UNF is one of the few online schools in Florida to offer accelerated online tracks; nursing students can take classes in eight-week, accelerated terms. Students in UNF’s online programs take courses asynchronously, synchronously, and in a blended format. At least 80% of each program’s coursework is available online. In-state students pay a discounted per-credit tuition rate. UNF reviews transcripts to determine applicable transfer credits on a case-by-case basis. The school participates in Florida Shines, a consortium that gives students access to online classes at various Florida institutions. Quality Matters recognizes UNF's distance learning programs. At Everest University-Brandon, students receive an accredited education from industry-experienced instructors through hands-on training with flexible class scheduling, truly a career-focused educational system. Online students at the school can pursue bachelor’s degrees in accounting, business, and computer information science. As one of the top Florida online colleges, Everest provides students with full access to tutoring and Everest's information resource library. After graduation, the Career Services department assists graduates with resume preparation and interview techniques to help them find the career they both want and deserve. In terms of online studies, the programs are designed with the same Everest accelerated learning format. Similarly, the online environment and classroom is both diverse and supportive and students have 24/7 support, ensuring that no student is left out or left behind. The school encourages students to work closely with the different departments to make sure that the entire system is working for the students the way it should. Indian River State College and its five campuses offer over 150 programs to more than 32,000 students each year. While its dedication to the local communities have been a major part of IRSC's mission over its 50-year history, the institution has also made considerable strides in making its programs accessible to everyone from everywhere, a dream that IRSC's virtual campus has made into a reality. Now one of the leading online colleges in Florida, IRSC offers hundreds of online courses, including 12 online bachelor degree programs in areas such as criminal justice, exceptional student education, nursing, and public administration. Each of the courses online are certified though Quality Matters (QM), a nationally recognized peer-reviewing process. In addition to offering some of the highest quality online courses in the country, IRSC also grants its online students access to its career and transition services to help all graduates find the career they have been aiming for. Each year, more than 25,000 students take one of the more than 100 degree programs offered at Eastern Florida, either at the main campus in Cocoa, one of the other three campuses in Melbourne, Palm Bay, and Titusville, or online. 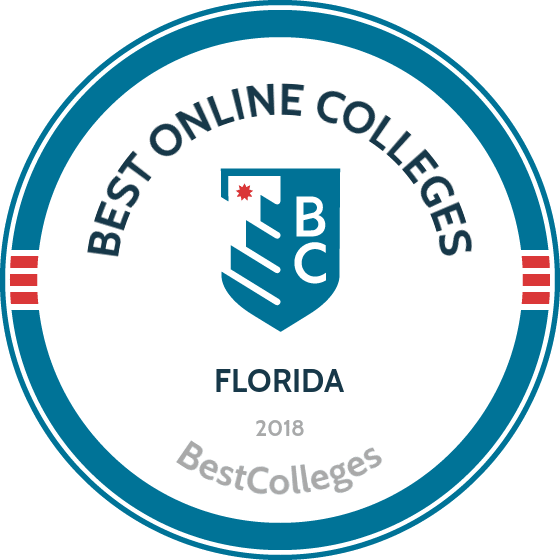 As one of the best online colleges in Florida, EFSC offers more than 250 online courses, each with small class sizes and interactive opportunities with other students and the instructors. Students studying online can pursue BAS degrees in the areas of applied health science, organizational management, or computer systems technology. EFSC offers 24/7 online tutoring through Smarthinking.com at no cost for online students, as well as computer software, like Microsoft Office 365, and other technological resources to ensure that everyone has the tools necessary for success. If you want to qualify for a range of high-paying job opportunities, earning a college degree is key. When deciding where and what you want to study, you may end up weighing both in-state and out-of-state schools. If you are from Florida, there are many advantages to attending college in your home state. Sticking close to home can qualify you for in-state tuition and help you build a network of regional professional contacts. You may also benefit from your school's name recognition on the local job market, and you'll be relatively close by if you need to occasionally visit campus. When researching programs, be sure to consider our list of the most affordable online colleges in Florida. All of the schools in this list are accredited, and our rankings highlight the colleges that offer the best blend of affordable tuition and return on investment. Few colleges in Florida offer the same mix of prestige, quality, and affordability as the University of Florida. The university boasts 18 online bachelor's degree programs in diverse fields such as anthropology and sports management, as well as a host of master's degrees, undergraduate minors, specialist degrees, doctoral degrees, and professional certificates. Through completely online and asynchronous courses, you can study with the same top-level faculty that teach on campus. Online tuition for Florida residents is exceedingly inexpensive; students pay 25% less than the standard in-state tuition rate. And for only a small additional fee, online students can also access many of the university's on-campus services, such as health services, athletic events and facilities, and transportation. Florida Gateway College offers two online bachelor's degree programs in early childhood education and water resources management, along with four online associate degree options and eight professional certificates. Most online courses can be completed asynchronously, making these programs ideal for working students who need to schedule their studies around other professional and personal obligations. Florida Gateway College is one of the most affordable online colleges in Florida; in-state residents receive markedly discounted tuition, as do non-residents that complete their coursework online. State employees and active and retired members of the military can also receive tuition waivers and additional discounts. Indian River State College's virtual campus is home to four online associate degree programs and eight online bachelor's degree programs. Online courses are asynchronous, and these degrees can be earned almost completely online. All online degrees require the completion of at least one in-person, proctored exam. IRSC is a proud "open door" institution, meaning that it guarantees admission to anyone who holds a high school diploma or equivalency. The low cost of tuition (especially for Sunshine State residents) makes IRSC one of the most affordable colleges in Florida. Ranked as one the best online undergraduate degree experiences by U.S. News & World Report, the University of Central Florida offers online undergraduate and graduate degrees, professional certificates, and baccalaureate completion programs. The school has 21 online bachelor’s programs, including Latin American studies, communication and conflict, and health services administration. The university supports its faculty to ensure they can deliver powerful learning experiences regardless of the medium. UCF is highly competitive when it comes to cost; in-state tuition and fee waivers for online students make this one of the most affordable online colleges in Florida. With more than 250 courses online, Eastern Florida State College is an excellent choice for those who want to earn an associate degree or bachelor's degree online. The school has 24 distance learning programs, including nursing, applied health sciences, and information technology. Courses range in length from 12 to 16 weeks and are administered through the Canvas online learning platform. While these courses have many asynchronous elements, they are not self-paced. Students are required to submit homework, take exams, and participate in class discussions at designated times. Low in-state tuition rates help Eastern Florida State College earn a top spot among affordable Florida universities. With more than 80% of its students graduating with zero student loan debt, it's no surprise that Polk State College ranks as one of the most affordable online colleges in Florida. Offering three associate degrees and three bachelor's degrees, Polk State prepares its students for careers in nursing, criminal justice, and business administration. Many courses can be completed 100% online; however, Polk State offers hybrid learning options for students who want to take advantage of in-person classes and labs. Group work and student collaboration are facilitated through the Canvas learning platform. Broward College is committed to offering affordable and high-quality higher education to Florida residents. Students can earn their associate and bachelor's degrees entirely online, or pick and choose from one of the hundreds of stand-alone courses that are also available. Some degrees can be earned in as few as 15 months. Classes begin every eight weeks so that students can choose a schedule that works best for them. Broward College offers a convenient single application for additional scholarships and grants. Students applying for scholarships must have at least a 2.0 high school or college GPA. Although many students are drawn to Florida International University for its beautiful Miami campus, FIU students also enjoy a comprehensive and high-quality array of online courses and programs. FIU offers dozens of online degrees, including construction management, music education, and public administration. Courses are asynchronous to maximize flexibility for students with work and personal obligations. FIU provides generous financial aid opportunities, including support for first generation students and a number of merit-based scholarships. Together, these characteristics make FIU one of the most respected, accessible, and affordable Florida universities. With over 150 degree programs, Florida State College at Jacksonville is one of the largest community colleges in northeast Florida. Online degrees are available in disciplines such as financial services, logistics, industrial management technology, and supply chain management. Most courses can be completed entirely online in an asynchronous format. Students can choose an accelerated track, completing eight week courses back-to-back and earning their degrees in as few as 18 months. Florida State College also offers some 200 institutional scholarships to students based on merit and financial need. Florida SouthWestern State College offers ten online degrees and several online certificates. Students at FSW can pursue associate and bachelor's degrees online in areas such as criminal justice, nursing, public service administration, and cardiopulmonary sciences. These courses, delivered through the Canvas learning platform, can largely be completed asynchronously, though students will need to complete proctored, in-person exams. As a sign of their commitment to distance learning, FSW has partnered with a proctoring service so that students who cannot travel to campus can take exams when and where they choose. Florida Gulf Coast University offers four fully online master's degree programs and three bachelor's degree completion programs. Three certificate programs and dozens of stand-alone courses are also available. Degree options include educational technology, criminal justice, and legal studies. FGCU is a member of Florida Shines, a network of online colleges throughout the state. As such, students at FGCU not only have access to quality, inexpensive courses at their home university, but at any number of other online colleges in Florida as well. The University of West Florida's online campus administers more than 50 degree and certificate programs, including a bachelor's degree in maritime studies and a master's degree in professional accountancy. UWF ranks among the most affordable colleges in Florida, and even non-residents can take advantage of the low cost of tuition. Out-of-state students may be eligible for an out-of-state tuition waiver that can reduce the price of their degree by 75% to 90%. Students who have served in the military can qualify for additional discounts and free tutoring. Admission standards vary from program to program, but many require at least a 2.5 GPA in order to be admitted. Daytona State College's online presence has grown from a single course in 1996 to more than 300 classes, four bachelor's degrees, and ten associate degrees today. DSC offers a dozen certificate programs, including accounting applications, business management, and cybersecurity and cyberforensics. The school acts a local leader in online workforce and continuing education programs. Although the tuition rate per credit hour is the same for online courses as it is for those taken at one of their five physical campuses, DSC is still easily one of the most affordable online colleges in Florida. At the State College of Florida, Manatee-Sarasota, associate and bachelor's degrees can be earned in person, completely online, or through blended coursework. The exact nature of how content is delivered is dependent on the individual course. Some faculty at SCF require face-to-face meetings at the onset of online studies, while others allow students to complete all of the course requirements at a distance. It is important to consult the syllabus for each class to know exactly what the expectations are. Palm Beach Atlantic University offers online bachelor's degrees in ministry, nursing, organizational management, and psychology. For graduate students, the school offers an online master’s degree in leadership. Additionally, students in any of the school’s on-campus programs may take classes online. Classes are eight weeks long and coursework can be completed anytime. In addition to grants and loans, students may qualify for up to $3,000 in scholarship awards. Remington College prepares its students for careers in high-demand fields. Students can study criminal justice, human resources, and occupational therapy wherever and whenever is most convenient for them. Remington's online courses, which normally last about 16 weeks, are both flexible and highly interactive. Students can complete some degrees in as few as 18 months. Online students are eligible for federal aid and institutional scholarships. Remington College guarantees that students' tuition will not increase so long as they remain enrolled in their online program. All new online students receive a Kindle Fire. Working professionals eager to continue their education will find a home at Warner University. Warner's online programs are designed to help busy students earn their associate or bachelor's degrees when time allows. Coursework for these online degree programs is 100% asynchronous; students only need to make sure they complete their assignments by the deadlines assigned by their instructor. Warner is committed to ensuring that students have the resources necessary to continue their education. Around 98% of students receive some form of financial aid, including Florida resident scholarships and church service grants. More than 20,000 students are enrolled in the 560 courses offered online at St. Petersburg College. SPC hosts more than 50 wholly online degree and certificate programs, including a bachelor's degree in dental hygiene, an associate degree in fire science technology, and a certificate in funeral arts. The eight-week long courses are offered asynchronously to fit around students’ personal and professional responsibilities. Students may earn up to 45 credits by completing proficiency exams or demonstrating professional experience. Tuition is exceedingly low for in-state residents, making SPC one of the most affordable online colleges in Florida. Saint Leo University, a Catholic institution, provides associate, bachelor's, master's, and doctoral programs entirely online. The school offers dozens of programs, including business data analytics, sports business, theology, and emergency management. Courses are eight weeks long and entirely asynchronous. Without the need to travel to campus or attend class at a certain time, Saint Leo's online offerings are perfect for students balancing life and school. Saint Leo is an especially affordable option for active-duty service members. St. Thomas University offers two online degrees: a master's in educational leadership and a doctorate in educational leadership and innovation. Although coursework is asynchronous, St. Thomas relies heavily on a cohort model. Online students will need to communicate regularly with their cohort throughout the program. Courses for both the master's and doctoral degree are about five weeks in length. New students in the master’s program are eligible for a $2,000 scholarship and new students in the doctoral program are eligible for $5,000. Many of Nova Southeastern University's 150 degree programs can now be completed entirely online and at one of the university's seven Florida campuses. Online students participate in the same classes as their peers who study in-person through live video conferencing. As such, most courses are synchronous and must be completed on a set schedule. The school offers online programs in a wide range of disciplines, including respiratory therapy and employment law. Online programs have much lower tuition than on-campus programs, making it one of the most affordable Florida universities. Southeastern University offers a wealth of online degree programs in education, criminal justice, business, behavior and social sciences, communication, and Christian ministries. Although admission into SEU’s online bachelor's programs does not depend on a particular level of academic achievement, students applying to a master's program will need to have at least a 3.0 college GPA. SEU states that 97% of its students receive financial aid. Additionally, because of the institution's Christian mission, the school offers further discounts to pastors, missionaries, and their dependents. Students at the Florida Institute of Technology have the opportunity to take online courses and pursue online degrees in high-demand fields, including cybersecurity and healthcare. Of particular interest is FIT's online associate and bachelor's degrees in aviation management, a job market expected to grow tremendously over the next two decades. All courses are asynchronous and 100% online; students simply need to complete their coursework and assignments by the weekly deadlines set by the instructor. Online students can take advantage of scholarships and grants. FIT alumni and military service members receive discounted tuition. Bethune-Cookman University is a historically black university located in Daytona Beach. The online college offers a number of high-quality undergraduate and graduate programs, including bachelor's degrees in sociology and international studies and master's degrees in organizational leadership and exceptional student education. Courses are typically eight weeks in length. They are offered both synchronously and asynchronously depending on the field of study. B-CU also has a number of resources specifically designed to support online learners as they pursue their degrees. Financial aid opportunities, including grants and scholarships, help keep B-CU's online programs affordable for Florida residents, military personnel, and alumni. As of fall 2012, Florida counted over 150,000 degree seeking students at Title IV institutions that were enrolled exclusively in distance education courses. Over 8,500 non-degree-seeking students enrolled exclusively in distance learning programs. Browse our list of the best online colleges in Florida for more insight into distance learning programs in this state. 68,064 undergraduates lived in Florida or the same jurisdiction as the school. Those outside Florida totaled over 72,000, and a further 726 came from outside the United States. Over 16,000 graduate students pursued online-exclusive degree programs within Florida's boundaries. Over 11,000 came from elsewhere in the U.S. In Florida, employment growth in this profession is strong. According to the Florida Department of Economic Opportunity, long term projections show an increase of 21% in the total number of jobs relevant to this field between 2014 and 2024. Wages increased by 25% from 2011-2016. What were the top careers in Florida in 2016 for people who had a degree in business administration and management? Data source: Florida Department of Economic Opportunity,, Bureau of Labor Statistics. Data may not be available for every year. In Florida, employment growth in this profession is strong. According to the Florida Department of Economic Opportunity, long term projections show a increase of 27% in the total number of jobs relevant to this area between 2014 and 2024. Wages increased by 4% from 2011-2016. What were the top careers in Florida in 2016 for people who had a degree in registered nursing? In Florida, employment growth in this profession is strong. According to the Florida Department of Economic Opportunity, long term projections show an increase of 35% in the total number of jobs between 2014 and 2024. Wages increased by 6% from 2011-2016. In Florida, what were the top careers in 2016 for people who had a degree in accounting? In Florida, employment growth in this profession is strong. According to the Florida Department of Economic Opportunity, long term projections show a increase of 36% in the total number of jobs between 2014 and 2024. Wages increased by 16% from 2011-2016. In Florida, what were the top careers in 2016 for people who had a degree in health/health care administration/management? In Florida, employment growth in this profession is strong. According to the Florida Department of Economic Opportunity, long term projections show a increase of 45% in the total number of jobs between 2014 and 2024. Wages increased by 11% from 2011-2016. What were the top careers in Florida in 2016 for people who had a degree in information technology?